When a simple trick goes wrong, 15 year-old Gilbert Myrddin, amateur magician and talented illustrator of his father’s original fairy tales, accidentally transforms a group of their readers into characters from his books (and himself into the spitting image of the aged magician Merlin). Struggling to find a way to bring everyone - including himself - back to normal, he embarks upon a wild odyssey through the world of his own fairy tales. The boy’s adventurous but unfulfilled quest takes an unexpected turn as he is put on trial for kidnapping and possibly murder. 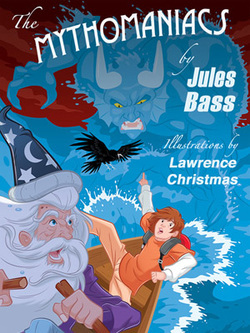 Bass' new novel for middle-grade readers from Eltanin Publishing, The Mythomaniacs, takes place in Devon, in the south-west of England, and from there transports the reader into many worlds of fantasy including a quest that leads back to Arthurian times. Illustrated by Lawrence Christmas.